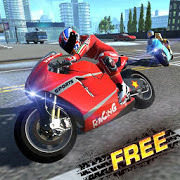 City Bike Race lets you be the top racer while dodging the traffic on the mean urban tracks. You only goal is to not crash or fall off your racer biker. Accelerate to the top speeds to get the top spot and finish the fastest. Ride in the most spectacular environment built just for performing the craziest bikes tricks.